How important is photo manipulation for advertisement photography? A lot of people have tried explaining the importance of impressive photo presentation and photo retouching for commercial needs. This notion has been considered as a grey hat advertisement technique that may proclaim something unreal to the consumers. The dilemma of drawing a line in digital makeup or the photo retouching techniques is still a topic of discussion as no one wants to draw a sharp line to it. Most of these arguments start out from some surreal image manipulations seen in magazines and advertisements. Media uses photo retouching techniques to its fullest efficiency and draws reader’s attention. The cover picture of a magazine that does not go under the scissors and brushes of a photo retouching professional is extinct. Images seen on magazine covers are not images of actual human beings or models. It’s just a complex version of collaboration from photographers, hairstylists, makeup people, and digital photo retouching professionals. Technicians use real people as one of the sources for bring out surreal images out of them and is definitely not the real splendor or look. The hyper real qualities are infused to the original image of models to make an effect that is tailor made to fit an advertisement or promotion. These days, we find stars stepping out to stand against photo retouching by going bare without the regular digital touchups. However, we don’t understand why people have to make public efforts to say no to digital makeup. Most of the public of this generation understand that images in commercials and advertisement photography don’t happen without photo retouching. There is no strong reason to proclaim it and stand against a technique used for digital makeup. Just like how women choose to vote for makeup, it has to be accepted as point of personal choice. The model or the person who is been photographed has to take a stand in this regards. 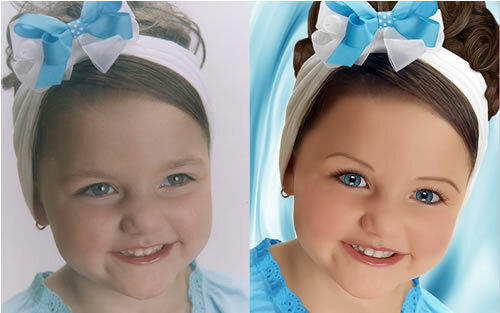 Photo retouching is one of the most commonly used photo editing methods that will facilitate ad makers to compose an object that they imagine and make it appear in picture. Product photography without photo retouching works, color correction, background removal and other image editing works might not look presentable. If a marketing professional wants to sell his product and attract clients, image manipulation and photo retouching techniques are inevitable. It never misleads anyone as everyone knows that skin without wrinkles and shiny white teeth are nothing but photo retouching techniques. People seem to enjoy how things might look if it gets spotless and perfect.